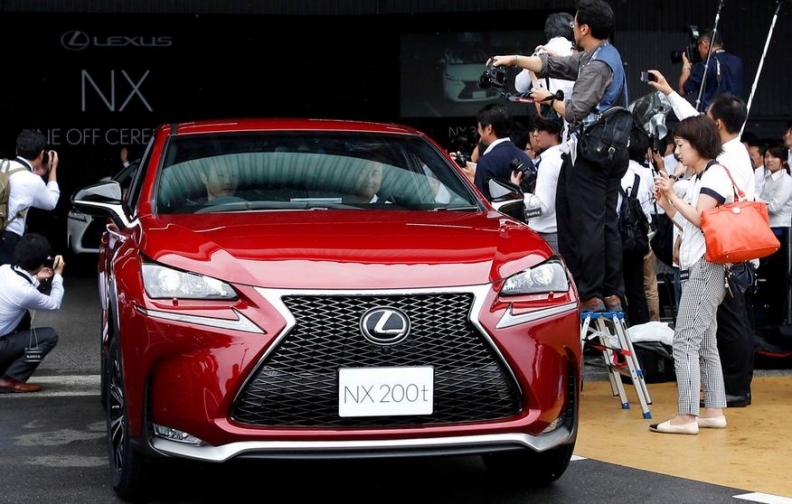 Lexus sold 2,666 NX SUVs in February, providing about two-thirds of the brand's entire monthly gain. DETROIT (Bloomberg) -- With a new entry in the hot-selling compact crossover segment, Toyota Motor Corp.’s Lexus brand has gotten itself back in the hunt for the U.S. luxury auto-sales crown. The new NX, a small SUV starting around $35,000, has helped Toyota’s luxury brand to a 26 percent sales gain this year through February, enough to hop over BMW for second place in the U.S. luxury sales race. The NX sold 2,666 in February, providing about two-thirds of the brand’s entire monthly gain. With its reputation for outstanding durability and its versatile RX crossover, Lexus was No. 1 in the U.S. for 11 years until 2011, when recalls and natural disasters tripped it up and the Germans seized control. Now the Japanese brand is back in the game. “The NX is a brilliant product and it really fills a pretty big hole that Lexus has had for a pretty long time,” said John Krafcik, president of auto researcher TrueCar Inc.
Last year, BMW AG’s namesake brand held off a late surge by Daimler AG’s luxury unit, Mercedes-Benz, to win the U.S. luxury title as Lexus finished 19,000 sales shy of second place. Lexus sales jumped 22 percent in February, led by the RX SUV, the brand’s top-selling model, which rose 14 percent to 6,490, and the GS sedan, which rose 18 percent to 1,851. Year-to-date sales through February totaled 46,126, placing it second behind Mercedes. Mercedes said deliveries jumped 4.5 percent to 23,616 for its best February ever. Results were led by the C-Class and CLA sedans and the new GLA small SUV. For the year, sales have risen 6.7 percent to 48,235. BMW still won the February luxury sales title, rising 14 percent in February to 25,201 as the 6 Series more than doubled to 1,237 and the X5 SUV rose 42 percent to 4,149. Through February, BMW deliveries have risen 9.7 percent to 44,182. The figures do not include non-luxury vehicles such as the Sprinter van or BMW's Mini brand.